German language ‘loves’ particles (Partikeln). 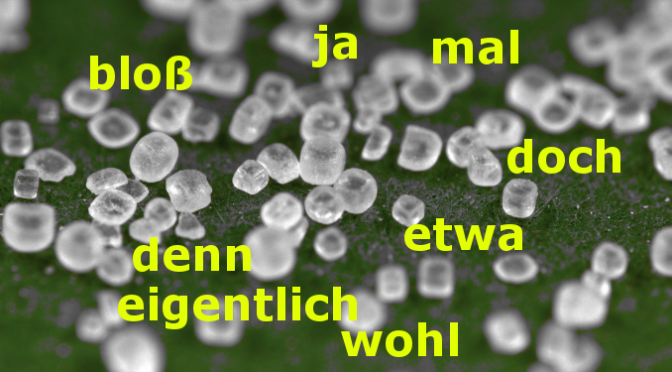 They are like salt & pepper to sentences and our German friends just love to use them. There are so many of them. Sometimes they cannot even be translated properly. Learn how to use them correctly. DENN occurs only in questions and it expresses somebody’s interest and amazement. Its purpose is to make the question sound informal (and compassionate): Was machst du denn da? was ist denn aus ihm geworden? wie geht es dir denn? JA expresses that somebody is convinced of something: das ist ja immer so. EIGENTLICH softens the sentence: bist du eigentlich verheiratet? ETWA in questions expresses that you have expected something else, doesn’t sound friendly: haben Sie etwa keinen Führerschein? WOHL expresses criticism and irony: Ein Kind malt auf der Tischdecke in einem Cafe. Was sagt der Kellner wohl, wenn er das sieht? ; er arbeitet wohl (aber nicht sehr fleißig); er hat die Prüfung wohl bestanden (aber nicht sehr gut); hat sie das Buch wohl gelesen? Wann hat er wohl Prüfung? BLOSS intensifies requests or questions– wo bleibt sie bloß? was soll ich bloß machen? geh mir bloß aus dem Weg! it underlines the message in declarative sentences, questions, commands or wishes i.e. expresses a certain emphasis : Das hast du doch gewusst; sie ist doch kein Kind mehr; es wird doch nichts passiert sein. in exclamations it expresses resentment or amazement: Du musst doch immer zu spät kommen! in interrogative sentences (questions) it expresses hope that the answer will be positive: Sie kommen doch heute Abend? expresses an easy going character of the declarative sentence and softens its seriousness: er will die Arbeit mal abschließen; du mußt mal zum Arzt gehen. in requests it lessons the seriousness and expresses the encouragement: komm mal her! ; geh mal zum Arzt!